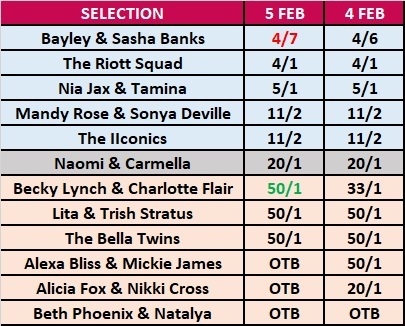 In a post published last night, I took a look over Sky Bet's market where customers can place wagers on the winners of the WWE Women's Tag Team Championship. The post was published before last night's episode of WWE Raw. Therefore, this was before Sasha Banks and Bayley were confirmed for the Elimination Chamber match to determine the new champs. The Boss 'N Hug Connection progressed to the Chamber with a win over Alicia Fox and Nikki Cross on last night's show. As I mentioned yesterday. they are the bookies' favourites to win. Since yesterday's win on Raw, the team has shortened from 4/6 into 4/7. With Bayley and Sasha Banks moving in, the odds for Becky Lynch and Charlotte Flair have increased from 33/1 into 50/1. In storyline, Becky Lynch has been suspended so it makes sense for Lynch and Flair to drift out. It also understandable considering there are reports that the final team to be added to the match will end up being Naomi and Carmella. With two episodes of Smackdown to go before the event, I surmise that tonight will be the night we get confirmation that it will be Naomi and Carmella. You can view the current prices in the table below. If you'd like to take a look at how the selections have been adjusted since December, I recommend checking out yesterday's post.